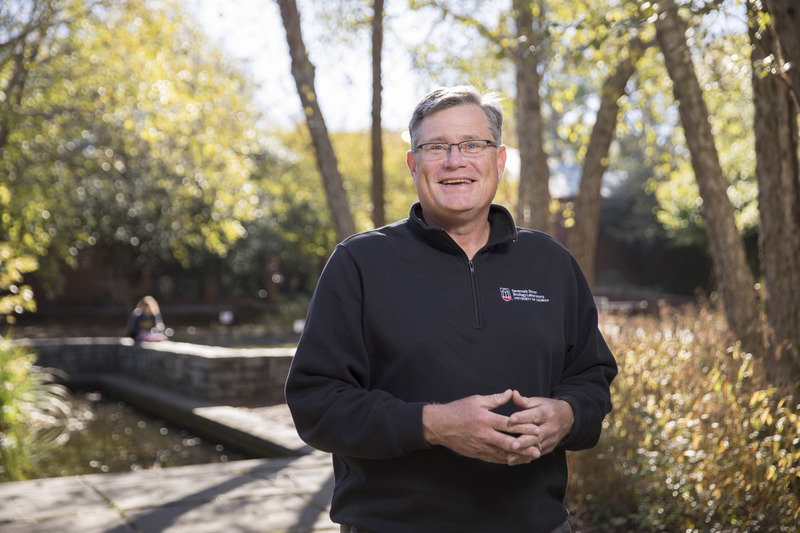 Olin “Gene” Rhodes, a professor in the Odum School of Ecology and director of the Savannah River Ecology Laboratory, conducts basic and applied research that informs the management and conservation of wildlife. I received my Bachelor of Science degree in biology from Furman University, my master’s degree in wildlife biology from Clemson University and my Ph.D. in wildlife ecology from Texas Tech University. I am a professor in the Odum School of Ecology and the director of the Savannah River Ecology Laboratory. My responsibilities include administrative oversight of SREL and supervision of the faculty and staff at our laboratory, as well as mentoring graduate students and conducting research on a variety of topics in wildlife ecology and genetics. I first came to UGA as a postdoctoral researcher from 1991-1995 and returned in 2012 to assume the director position at SREL. I was a faculty member at Purdue University for 15 years, followed by a two-year stint as the assistant director of the USDA National Wildlife Research Center in Fort Collins, Colorado, before returning to SREL. I would say that three things brought me back to UGA: my desire to help bring back SREL to its status as a leading ecological research center in the U.S., my recognition of the excellence of UGA as an educational institution and, of course, the fact that SREL is about 50 miles from Greenwood, South Carolina, where I grew up. I do not have a teaching appointment at UGA. However, I do teach a workshop for our Research Experience for Undergraduates program in radioecology here at SREL. In that workshop, I teach undergraduates the basics of how to prepare for, evaluate and compete for the opportunity to enter graduate school. While at Purdue University, I was the graduate coordinator for my department, with over 100 graduate students, and served as the chair of the graduate council in the College of Agriculture as well as the chair of the Life Sciences Committee for the Purdue Graduate Council. It is very enjoyable for me to take what I learned in those roles and share it with prospective graduate students from a wide variety of scientific disciplines. While serving as a professor in the Odum School and as director of the Savannah River Ecology Laboratory, I have had the privilege of serving as the president to the Association of Ecosystem Research Centers and the honor of being awarded the Caesar Kleberg Award for Excellence in Wildlife Research, one of the highest awards given by my professional society. In addition, I have been extremely pleased to be the director of SREL as we have grown from about 35 to 140 faculty, staff and students and re-established our presence in the scientific community over the past seven years. My research has always been a mixture of basic and applied science with the expectation that the studies I conduct will inform the management and conservation of species by practicing wildlife managers. For example, one of my favorite talks to give has always been “Wildlife Genetics: The Conceptual Development and Application of Theory.” The title of this talk reflects my desire to develop population genetics theory into practical application using state-of-the-art technologies and well designed, statistically defensible research approaches that extend our understanding of the ecology and management of wildlife species. My research has been used by wildlife practitioners all over the world to further conservation efforts for endangered species, to refine and optimize reintroduction programs, to improve approaches to the mitigation of wildlife diseases and to help alleviate human wildlife conflicts. Although I do not currently teach at UGA, I did teach over 12,000 student credit hours in my previous faculty position at Purdue University. I always found having an active research program was critical to maintaining topical and vibrant course content, especially for graduate level courses and courses for non-majors. In particular, having a handle on the state-of-the-art technologies and current topics of scientific debate were useful for helping students to understand the emerging opportunities that might be available to them in scientific careers, as well as to stay informed on the latest thinking and facts regarding the big picture scientific controversies that they, as members of our society, would one day have a say in addressing. My goal as a teacher has always been to help students learn to think for themselves by providing them with opportunities to problem solve in the classroom and helping them appreciate that there are always multiple viewpoints surrounding any scientific issue that is of critical importance to our society and our environment. It is way too easy for folks to go through life without allowing themselves to be challenged by alternative viewpoints on how important various scientific issues are to their everyday life, how important science is to our future as a species and even what a scientific fact actually is. It is important that one learn how to listen to alternative viewpoints and how to sort fact from convenient truth if we hope to continue to live and prosper on this planet. They listen, work hard, think critically and accept responsibility for their own successes and failures. Because I actually live and work in Aiken, South Carolina, I do not spend as much time on campus as most other faculty. However, when I am there, one of my favorite places is the area between the Warnell School of Forestry and Natural Resources and the Odum School of Ecology. I enjoy spending time between meetings sitting on the benches that Warnell has named for members of their faculty who have passed on and enjoying the natural atmosphere of this space on campus. I really like to fish, hunt and occasionally play golf. I enjoy nature and cherish opportunities to spend time alone or with friends out in my favorite fishing or hunting spots. At this point in my life, enjoying the experience is much more important to me than whether I actually harvest anything to eat. I participate in several different fundraisers a year here in my local community. These often involve golf-based fundraisers for United Way, animal welfare or specific health issues. I also frequently give talks on a number of topics to local clubs or civic organizations in the community. I have at least two favorite movies. One is “Once Upon a Time in the West.” This is just a good old-fashioned Western that was directed by Sergio Leone. I love the music and the storyline and if you have not seen it, you should give it a try. My second favorite movie is “Guardians of the Galaxy.” I REALLY like the music and just find the entire movie hilarious. As far as favorite book, I have lots, but I read Tolkien’s “Lord of the Rings” trilogy about 10 times before I turned 18 if that tells you anything. One of my favorite experiences at UGA was when I got to interact with Dr. Eugene Odum, the namesake of the Odum School of Ecology. I can still remember Gene visiting SREL each summer when I was here as a postdoc. He was fantastic to talk with and always seemed genuinely interested in what you were doing, why you were doing it and what you hoped to learn. He was one of a kind.